Obviously, I did both of these line studies today, since I was busy elsewhere yesterday. I really liked the concentric squares I did for 16, so I went back to my ruling pen just to see what effect it would have on the same sort of lines. I’m not wild about the little tails that happen at the corners (I find it takes a little more concentration with the ruling pen to end exactly where you want to end), but that’s being nit picky. I like how quilty this looks and in fact it is inspired by the giant log cabin quilt I made earlier in the year, and the giant log cabin which inspired it. As long as I had the ruling pen out, I thought I’d play with curvy lines. 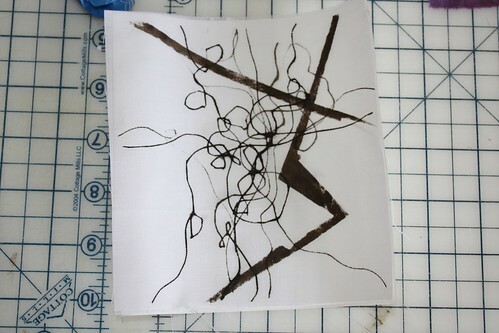 I also saw a glimpse of fabric or something on a blog that had a wonderful combination of straight, thick lines (like partly crumpled strips of paper), and wild curvy ones (like a tangle of string). My conclusion is that ruling pens are called that for a reason. They make rules (that’s what straight lines are called in graphic design parlance). I can think of better tools for making curvy lines. It was kind of fun scribbling all over though. I’ve been receiving government run health care for over 15 years now. Before that I belonged to an HMO through my employer, and before that, I was on my parents’ health plan. I know a lot has changed in 15 years, but I remember the HMO as having a decent amount of doctors to choose from, either dental or optical coverage but not both, and reasonable co-payments. I didn’t stay in one place long enough, nor get sick often enough to establish much of a relationship with any one doctor, with the exception of my pediatric dentist — though when I knocked a tooth out, I still had to go to a different emergency dentist. Since joining the government run system care of my husband joining the army, things have been pretty much the same. In the last five to ten years, we’ve been assigned a Primary Care (Manager) physician who we are supposed to see first, but since we move a lot, and so do Army doctors, we rarely see these PCMs. However, my husband did have one he saw regularly, and since the few pediatricians at any one post hospital or clinic are usually civilians working under DoD contract , and the kids are the reason for the majority of our doctor visits anyway, we tend to see the same one or two pediatricians by default even though they are not our PCMs. For annual checkups we rarely have to wait more than two weeks for an appointment and for follow-ups we can usually request the same doctor. If we want to see someone right away we can show up for sick call and wait our turn for whoever is on call, or go to the emergency room or acute care clinic and see whoever is on call. I don’t have much experience with acute care in the civilian world, but from what I hear, it’s not too different. Well, except for the fact that all we have to do is show an ID card and fill out a one page form. Done. No money changing hands, no being refused service, no bills later. It cost about $50 to give birth to my son in a military hospital, and most of that was the meals for me and my husband after the baby was born — I got the room free the first night and the baby got it the second. My daughter was totally free. The entire bill from the participating german hospital where she was born was covered by our government health care program. Now, to be entirely truthful, we DO pay. We pay taxes (except when my hubby is deployed), we have little geographic stability since when the army says we have to move we have to move, and we pay with the consequences of a husband/daddy who is essentially on call 24/7. He could even pay with his life. If “socialized” medicine were to be further implemented for the general public though, I’m quite confident that people would merely be paying with taxes and co-payments, not their lives — so in that sense it’s even better than what we get. Oh, and speaking of co-payments, I go to an approved dentist (plenty to choose from) and on average pay between $10 and $80 depending on what we have done (no braces on the scene yet so that could change). Yesterday, my daughter hurt her wrist at recess. I opted to take her to the Acute Care clinic at Schofield Barracks, our closest post. I could have called for a same-day appointment, but they tend to fill up before 11:00 so I probably wouldn’t have gotten one anyway. I could have also gone to the Emergency Room at Tripler Army hospital, but it’s not so close and I was really hoping she only had a sprain and it could be treated at the clinic. We waited 30 minutes to be triaged. Then we went straight to Radiology (two buildings away) and got X-rays within 15 minutes. Then we waited almost an hour to see the doctor. He confirmed the bone was fractured and she’d need to have it set and casted at Orthopedics. We drove to Tripler (this is where going to Tripler first may have been advantageous, although, their Emergency room sees more action than Schofield’s, so the wait could have been longer) and waited to see the doc there. Unfortunately, we had snacked a little after radiology, and that was messing up the timeline with the sedation they wanted to give her to set the bone, so no one was in a hurry to see us (we still had over four hours before she was “clear”). Then the shift changed and we got a new doc. He chatted with my daughter and proclaimed her very mature and brave and we all decided together that she could handle local numbing and we’d get home much, much sooner. Another wait, fun with finger traps, training on splint building, and a quick trip to Tripler’s radiology department and we were on our way home in time for dinner. Yes, I spent the entire midday and afternoon in hospital waiting rooms for my socialized medicine, and no, I didn’t see any doctor that I had ever seen previously — but I’m pretty sure it would have been the same at any other civilian hospital — maybe longer if you figure in time spent filling out payment and insurance forms. We’ve already got our follow up appointment for next week, with the same doctor, my daughter will be getting a pink cast, information about her healing will go into a study about splints versus casts in the first week post injury, and all is have to worry about now is what outfits we can stretch over the splint. If this is government oppression, then oppress me more! 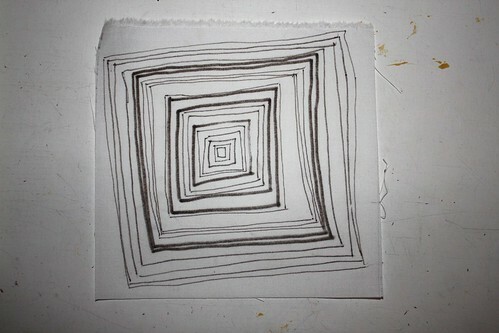 In addition to drawing 30 lines in 30 days along with Melanie Testa and others, I am posting inspirations and possible quilty (or fabricy) ideas on Sundays along with Sherri Lynn Wood. While I was at Quilt Hawaii over the summer, I admired the carpeting just beyond the lobby at the Marriott. Though one wouldn’t necessarily think that a carpet could be inspiring, this one pretty much screamed out that it’s a Dresden Plate block. It could be scattered, like the carpet, or it could be simplified and organized into blocks like a traditional quilt. For most of Saturday I decorated the tree and house for Christmas. I posted Friday’s line study late in the day and though I didn’t post Saturday’s study, I did do it at the end of the day. This is my view of my cat most evenings as I sit on the couch and he snuggles next to me. I made a point of doing my line study early today, so as not to forget about it like the last two days. 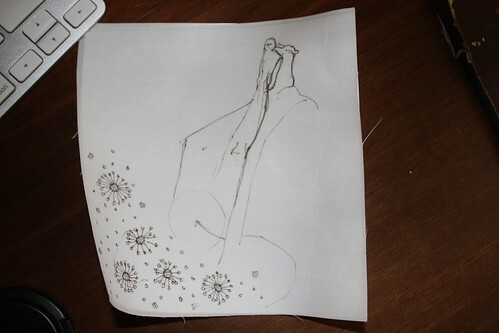 This was going to be a sketch of my son lounging, legs in the air, on the recliner. But, he got up and walked away, so I drew the atomic flowers on my pajama pants. I’m a day behind. 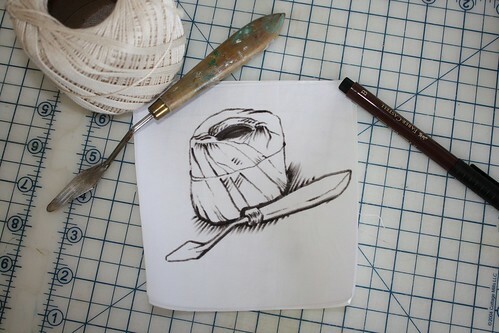 This is Friday’s line study. I spent most of the day working on a medallion quilt, so concentric squares were on my mind. I used my now-trusty PITT pens. I think this would lend itself well to a go with the ruling pen, but since I spent most of today (Saturday) putting up Christmas decorations I won’t break out the pen and paint this evening. Check out the Flickr Group Melanie started to see more interesting lines. 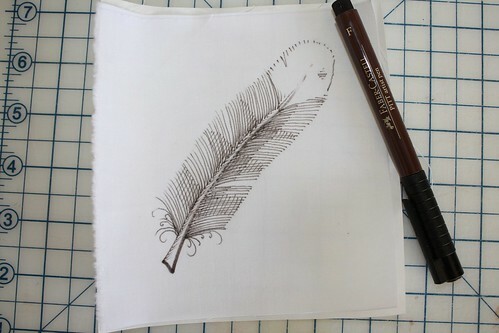 A feather for “Turkey Day.” I drew it from my imagination, so I’m pretty sure it’s not ornithologically correct. Have a great Thanksgiving!! I know I said I’d work on a gestural line today, but I got side tracked by the big ball of lines I drew yesterday! I snipped a piece of string, dunked it in my ruling-pen-ready paint, laid it on my glass, laid the fabric on top, and gave it a quick roll with my brayer. 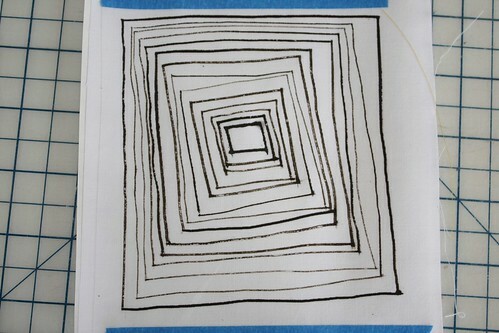 Then I rotated the fabric and made another print. Fun. Yesterday got away from me and I didn’t get around to doing my line exercise. 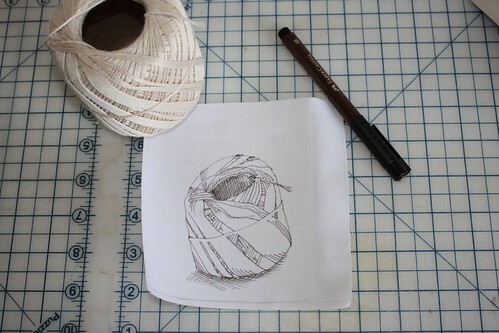 So, today I sat down with my fabric, marker, and line-y subject and used the entire 15 minutes to draw a ball of string. 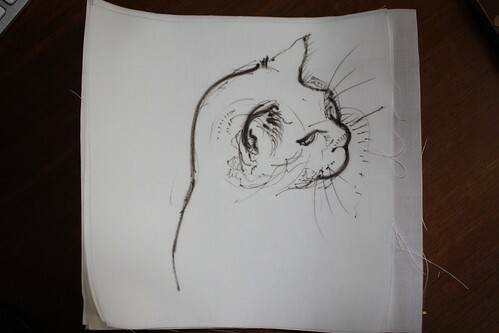 I envy those who can make a well proportioned contour drawing without a bit of pencil sketch as a guide. As you can see, I could have used a guide. 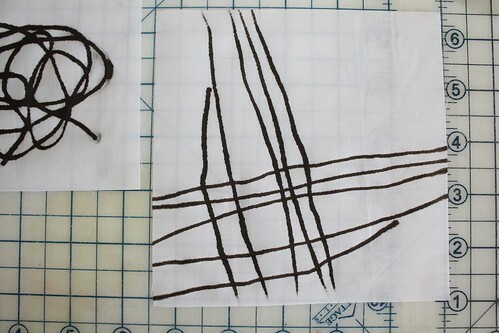 However, I don’t see this exercise as necessitating perfection — for me, it’s about drawing and mark making. After making up for yesterday, I switched to a wider marker with a brush-like tip.